Israeli children run for cover in Sderot after Palestinian terrorists launched another missile attack on their town. Today the Guardian reported that the Palestinian terrorists in Gaza are using Google Earth in their attacks on the schools, etc. that are attacked in Sderot. Internet Savvy Palestinian terrorists are using Google Earth to target attacks on the town of Sderot, Israel. “We obtain the details from Google Earth and check them against our maps of the city centre and sensitive areas,” Khaled Jaabari, the group’s commander in Gaza who is known as Abu Walid, told the Guardian. Al-Aqsa is one of several militant groups firing rockets, known as Qassams, from Gaza into Israel. A rocket attack by Islamic Jihad on a military base last month wounded more than 50 soldiers. Hamas’s military wing, the Izzedine Qassam Brigades, is not believed to be firing rockets. 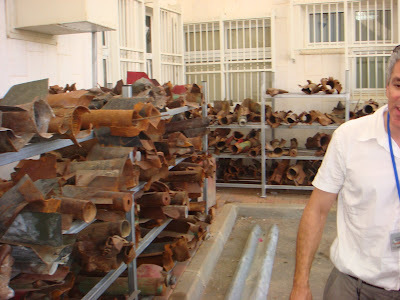 In the first six months of 2006 after Israel withdrew completely from Gaza, there were 500 Qassam rocket attacks on Sderot. The city started collecting the rockets and has them stashed out back of the police station.